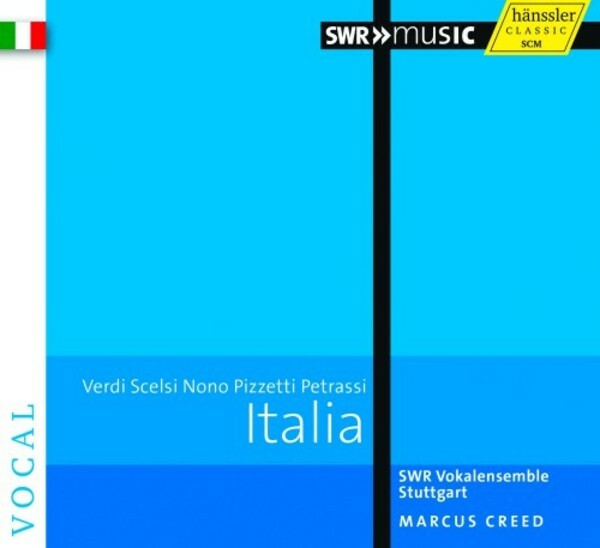 In this latest instalment of recordings focusing on the choral traditions of different countries launched in 2014 by the Vokalensemble Stuttgart des SWR, we now arrive in sunny Italy, a country said to have no native choral tradition. Giuseppe Verdi of course used choirs in his operas, but apart from that there are only a few choral works that have sustained any place in the repertoire, some of the finest of which are presented here. With the beginning of the 20th century, however, one encounters composer�s that are less well known, but who have certainly composed some very exciting music for choir, including Pizzetti, Giacinto Scelsi, Luigi Nono and Goffredo Petrassi. They all offer poignant, poetic, funny, mysterious, ironic choral works that are original and always interesting in their structure. They show an Italy away from the operatic bel canto, but certainly not lacking in beautiful melodies. This is a most worthy addition to their on-going �country� series. The Vokalensemble Stuttgart des SWR is one of the most internationally acclaimed choirs. Their scholarship, adventurous programming, wide range of styles and impeccable vocal performances are their trademarks. For many years, the Vokalensemble has been considered one of the top ensembles for contemporary music and has, throughout its 65 year history, presented more world premieres than any other professional choir.